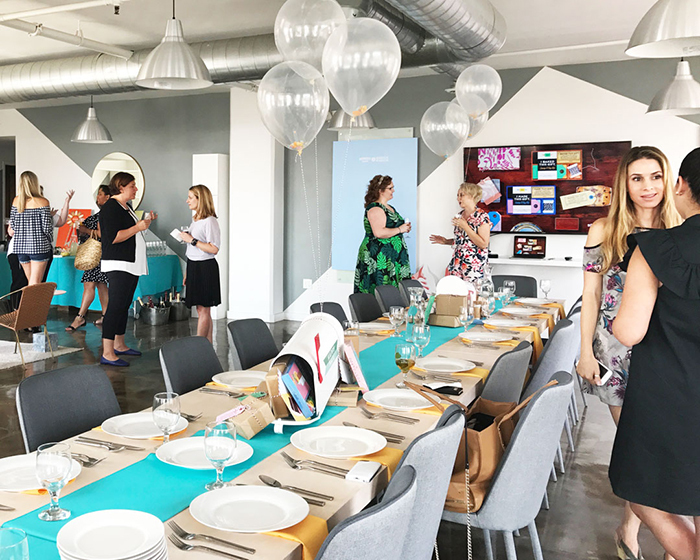 We had a blast at our Mimosas in the Crafternoon with Robert Mahar brunch bash on June 22 in downtown Los Angeles. Knock Knock broke out the champagne (and orange juice) to celebrate our artsy collaboration with crafty jack-of-all-trades Robert Mahar. 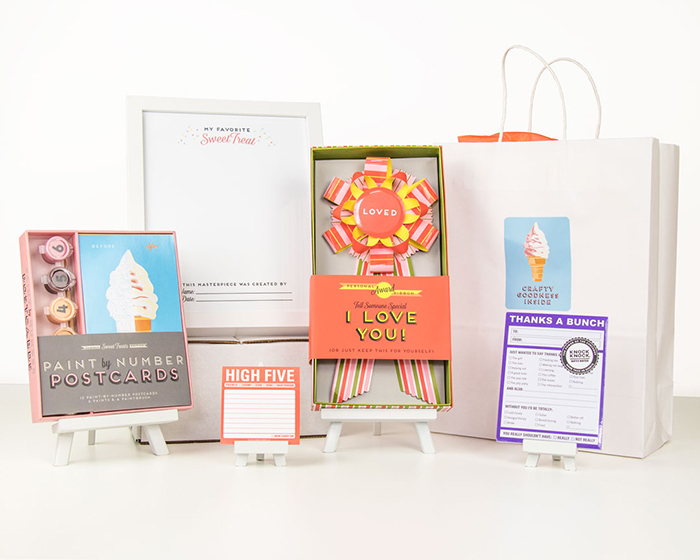 The collection includes Paint-by-Number Postcard Kits, Personal Award Ribbons, and new Gift Stamp and Tag Kits. 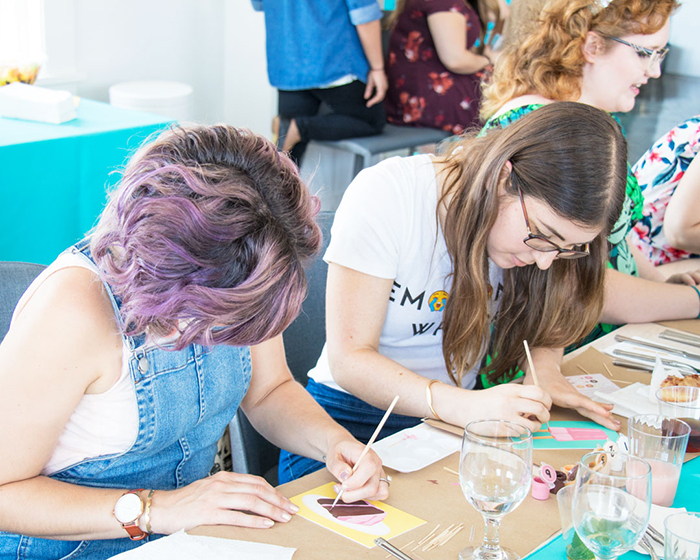 We loved hanging out with local DIY mavens and fellow craft lovers, painting up a paint-by-numbers storm while enjoying tasty treats and savory eats. Here are highlights that will serve up some serious FOMO. We chose a venue in the heart of downtown LA, a few blocks away from Robert’s studio. It just so happened to be a chic penthouse 14 floors up, with sleek, mid-century décor fit for a true SoCal fête. 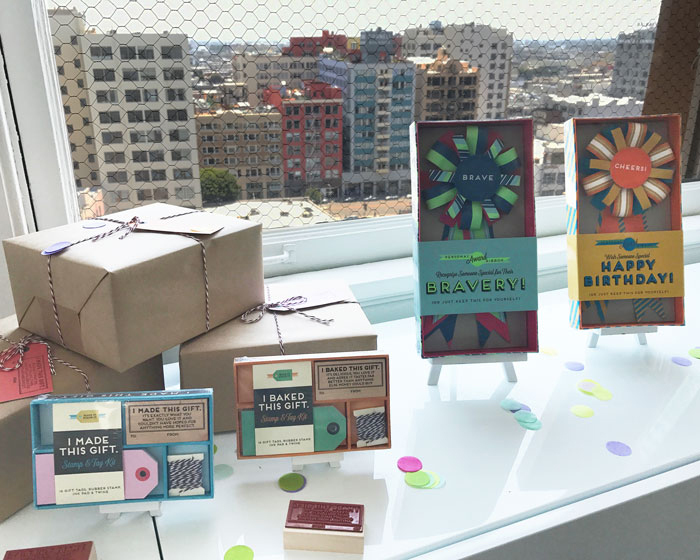 Crafternoon views of downtown Los Angeles from the 14th floor. Up close: Robert’s Gift Stamp and Tag Kits from our new Fall 2017 season and Personal Award Ribbons. 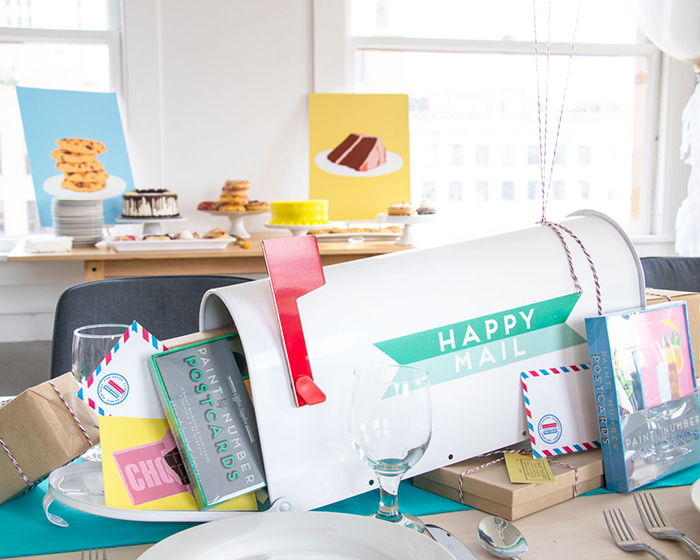 Robert designed each mail-inspired centerpiece using items from the collection. Twine, old-school envelopes, and painted postcards were a crafty touch! Mingling with mimosas is always a good idea. Robert created these centerpieces with his Paint-by-Number Postcards in mind. Remember the days when your only inbox was a mailbox? 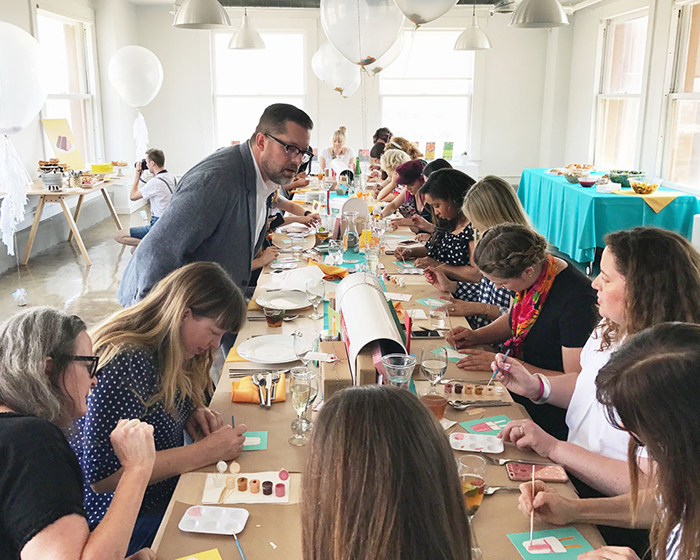 After lunch, we broke out the paint pots and brushes as Robert guided our guests through painting their own vintage-inspired Sweet Treats Paint-by-Number postcards. The table was full of cakes, pies, and popsicles coming to life. We loved seeing each guest add her own artistic flair to her mini masterpiece, not necessarily following the kit’s painting key. Robert was on-hand to answer any crafty questions. From left to right: Painting away are fellow crafters and DIYers Sarah Hearts, Karen Kavett, and Amber Petty. Check out the depth and extra plate detail on this painted postcard. Did Jenny Hart of Sublime Stitching paint this or Van Gogh? Our head honcho, Jen Bilik, introduced Robert. Fun fact: Robert was the art director for Jen’s wedding in May. In a nod to Robert’s doughnut connoisseur status, our dessert table was decked out with treats from a few of his favorite local bakeries, Astro Doughnuts and Lark Cake Shop. It was equally gorgeous as it was delicious. Yum! We used illustrations by the lovely Hannah Berman from our Sweet Treats Paint-by-Number Postcards Kits to spice up the room and our photo area. Our friends ate them right up. 6. OMG = Oh My Goodie (Bags)! 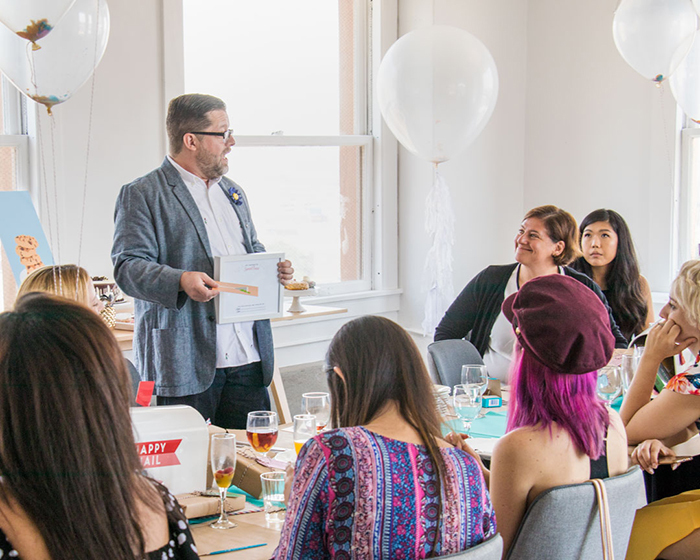 All attendees walked away with a Knock Knock gift bag filled with a few stationery essentials, including a Robert Mahar for Knock Knock Paint-by-Number Kit, Personal Award Ribbon, and Knock Knock notepads. 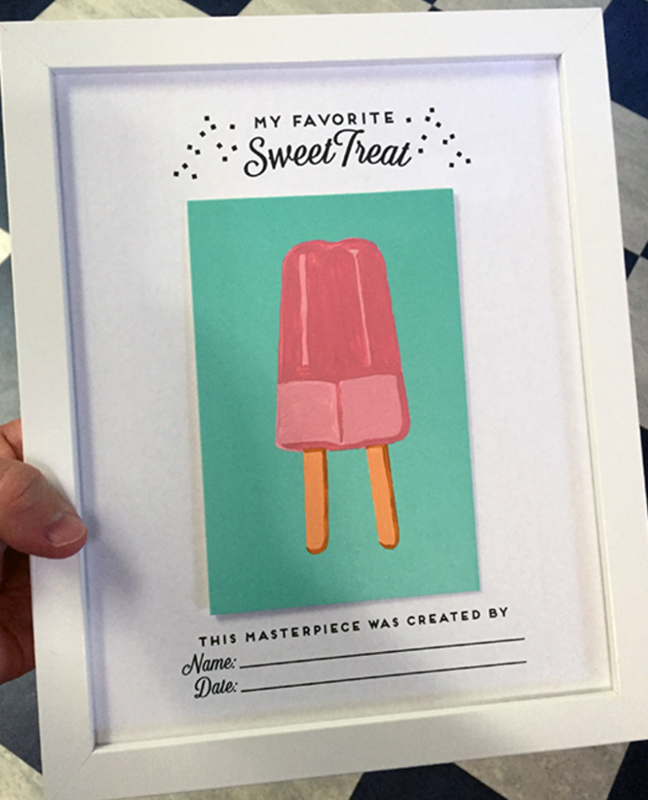 In case they wanted to show it off (rather than mail it off), we also gifted each guest her own frame to encase her new work of art—complete with a special Sweet Treats framing mat created by Robert. While Robert’s Paint-by-Number Postcards are intended to be mailed to friends, they also make delightful keepsakes and gifts—especially framed. What a delectably good time! 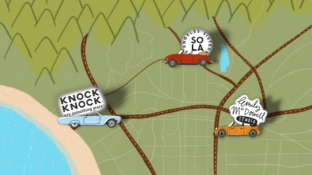 Be sure to follow Knock Knock on Instagram for more behind-the-scenes snippets from events. Enter below through the Rafflecopter widget. You could win everything in this photo! The giveaway ends Thursday, July 6. Good luck, crafty people! So excited to be a winner! Thank you! !